The next pull out is not named and so of course we call it No Name Point. This is a good spot to pause, look at your map and plan your remaining stops and perhaps some hikes. 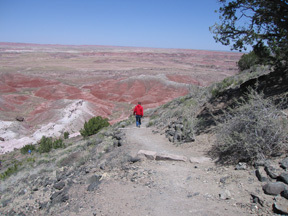 You may hike anywhere in Petrified Forest National Park within the following guidelines. If there is a designated walkway or path you must stay on it. You may not walk into any areas with signs indicating closed area or authorized vehicles or personnel only. (these are few) Otherwise you may strike out into the Painted Desert or the Petrified Forest on your own. You must park your vehicle in an overlook parking lot or if you pull off on the side of the road you must be completely off the roadway and on the other side of the designated white line. The park closes at 7PM in the summer and 6PM at other times of the year. At closing time you must be in your vehicle heading for an exit. This entry was posted in National Parks, Petrified Forest and tagged Arizona, back country, hiking, Painted Desert, Petrified Forest National Park, tips, wilderness area. Bookmark the permalink.